Senior Derrick McKnight handling the ball in the Rams matchup against West Liberty. McKnight led the Rams in scoring with 18 points. (Photo Courtesy of Shepherd University Athletics). The Shepherd men’s basketball team (10-9, 6-7 MEC) lost in their matchup against number one ranked West Liberty University, Wednesday Jan 30. It was a cold evening here in Shepherdstown, as the Rams got off to a strong start against West Liberty, which is ranked number one in the Mountain East Conference and eighth nationally. The Hilltoppers are known for their three point shooting and high scoring offense. So going into the game the Rams knew that they were going to have to knock down shots and also contain this high scoring offense. 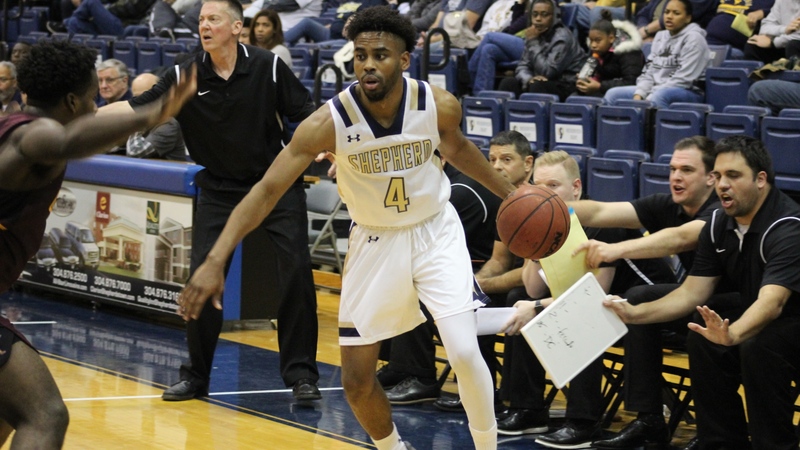 In the first half Shepherd did a great job at contesting West Liberty’s three pointer’s, as the Hilltoppers shot 5-19 from behind the arc, while the Rams went 7-14 from behind the arc and 14 – 32 from the field. Senior Derrick McKnight led the Rams in scoring with 18 points, despite only scoring two points in the first half. WLU tied the game at 35 with a layup by Evan French in the paint, with only 28 seconds remaining in the first half. The game consisted of eight ties and 14 lead changes throughout the game. In the second half Dalton Bolon started to catch fire, as he led all scorers with 23 points and 15 rebounds. Bolon was wearing a black eye patch on his left eye, but did not that it stop him as he scored most of his points from the inside. WLU won the battle on the boards, with 40 rebounds compared to SU’s 35, rebounding hurt Shepherd in the second half. On several occasions Shepherd gave up second chance points from not getting the rebound. Transfer Malik Sanders gave the Rams a boost on offense collecting 14 points, Wednesday was his first start for the Rams. Winston Burgess went over the 1,000th point mark in his career (1,004), he finished the game with 11 points. It was a great milestone for the fourth year senior from Stafford, Virginia. Shepherd fought back despite an 11 point deficit, bringing the game within two points in the final minute of the game. Unfortunately they were forced to foul so that time wouldn’t expire, but the Hilltoppers knocked down all of their free throws, giving them the edge in this one. Next articleTibbs breaks three point record as the Rams beat Wheeling Jesuit 79-65.